The word "Blitzkrieg", or "Lightning War", comes to mind whenever I think of the German military in World War Two. Massed formations of Panzer tanks accompanied by Sdkfz. 251 armored personnel carriers crashing into the Allied armies, while overhead Stuka dive bombers rain terror from the skies. This happened in the years 1939 through 1943. The Second World War was the first truly mechanized war. 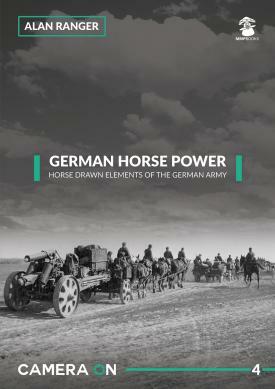 So, it was an interesting surprise to receive this recently published title from MMP Books detailing the use of horse power during the war, and the huge importance it played. It must be remembered that Germany was banned from the production of many war items following the signing of the Treaty of Versailles in 1919, and her Army's troop strength was severely limited. When Hitler and the Nazis came to power in 1933, they tore up the Treaty, but Germany was in the midst of a horrific economic depression. One couldn't just hit a switch, and suddenly start turning out thousands of military trucks, tanks, half tracks etc. The tooling up of German industry to start production of these items took time, and due to the restrictions of the Treaty of Versailles up until 1933, it would be a while before German industry could catch up with the mechanization the military commanders desired. When German forces burst into Poland in September 1939, many of the German armored units utilized tanks that had in fact been produced by Czech armaments firms that German industry had taken over when Czechoslovakia was occupied over a period of months in 1938/39. So too with the invasion of France and the Low Countries in 1940, Germany's armed forces again relied heavily on tanks produced by Czech factories. After the French were defeated, large numbers of captured equipment were pressed into service by the Germans, and French firms were soon turning out mechanized equipment, especially trucks, to help Germany improve the mechanization of their armed forces. Yet despite the efforts of German AND captured French, Czech etc. industrial capacity, Germany was never able to fully mechanize all their military units, not even close. The necessity to use horses actually increased to some extent as the Allied bombing raids started to lay waste to German industrial facilities, and the losses on the various battle fronts increased. The horses, then, were primarily used to pull wagons of various kinds, along with various wheeled guns. These wagons were often of wooden construction, including the wheels, though there were wagons that utilized steel construction and with pneumatic tired wheels, especially as the war progressed. Huge numbers of supply wagons were "liberated" by the Germans as they invaded the nations of Western Europe in 1940, and then the Soviet Union in 1941. These vehicles, German or captured, were often based on designs dating back to the First World War period. How important was the horse and the vehicles they towed can be seen in these statics listed in the book: in 1944, German industry produced 40,700 infantry carts, and 150,000 field wagons of all sizes! This book measures 8.25 by 11.5 inches, and is 80 pages in length. It has a card stock cover, and all the photos contained within are in black and white. All are period photos from World War Two. The paper used for the pages has a matt finish, and for the most part the photos are well produced. Each has a well written caption so the reader is in no doubt as to what they are looking at. Only a very small number are printed across the gutter of the book. Following a brief but illuminating two-page written introduction to the subject, the book is then divided into three sections. The first covers what is listed as the "If. 5 Machine Gun Wagon model 36", described in 18 pages of photographs. Next comes 31 pages on various "Army Wagons", both two and four wheeled. Wooden wheeled and pneumatic wheeled varieties. The third section of the book is titled "Artillery Vehicles", which covers various field guns, their limbers, and the horses pulling them. Some of these guns are large enough that they require a team of six to 10 horses. This is the first book I have seen on the subject of this important but apparently neglected aspect of the German military in World War Two. There are innumerable books on the tanks, half-tracks, SPGs, trucks and other mechanized machines of the ground war. But the humble horses and carts etc., apparently aren't glamorous enough despite their importance. As such this book comes highly recommended for anyone interested in the Germany military in World War Two. My thanks to MMP Books for providing Internet Modeler with the review sample.